If you are Hollis, please join here and update your profile! Updates to Hollis' profile since your last visit are highlighted in yellow. Hollis Smith was born in Belton, Texas in 1931. He lived there for 4 years when his family moved to Milam County, Texas. He went to school in Cameron, Texas and graduated in 1948. While in high school Hollis got his first taste of mechanical engineering when he and a bunch of classmates took an old farm wagon apart, carried the parts up on top of the school building and then put it back together again. No one ever found out who was responsible for that engineering miracle. After graduation Hollis Smith joined the United States Air Force and went to Lackland AFB in San Antonio, Texas for basic training. As luck would have it he was assigned to Air Frame and Engine Mechanics school at Keesler AFB, Biloxi, Mississippi. Hollis lost his class ring in the gulf while at Biloxi. He trained there for 6 months and then was assigned to Brookley AFB in Alabama as a flight line aircraft mechanic until some time in 1950. He was then sent to Yokahoma, Japan as a flight line mechanic in August of 1950. The Korean War was just beginning. Early on in the Korean War what was to become known as "K Bases" were developed. That was where scout patrols would find an area with a clearing within a forest. They would call in cargo carriers that would dump rolled up steel mats that would be layed down to be used as a runway for USAF planes. Hollis was a flight line mechanic and when USAF planes would get shot up during combat and could not make it back to their base, they would land at a "K Base" for repairs. The "K Base" would have only one structure for operations so the airmen had to sleep in tents. Gets pretty cold in Korea. Hollis stated that the Koreans knew that the vulnerable part of the USAF planes was the oil coolers and so that's what they would target. In December of 1950 Hollis left for the states and had a 14 day delay in route for some R&R. 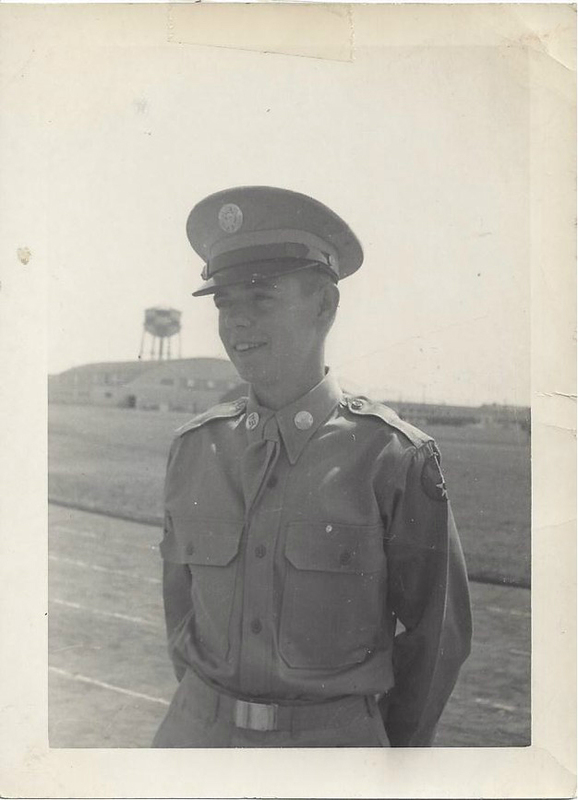 In 1951 Hollis entered Officer Candidate School at Randolph AFB, San Antonio, Texas. During this time Hollis applied and was accepted into flight school. After 26 additional weeks he graduated. They spent time both in ground school and the link trainer ultimately learning to fly in the old T-6 trainers. Hollis says those tail draggers were easy to fly and next to impossible to land. Hollis was commissioned a 2nd lieutenant and assigned to Reese AFB in Lubbock, Texas because he had expressed an interest in flying bombers. There he trained on Beech twins. Upon graduation Hollis began flying C-47s, the old Gooney Bird. After another 26 weeks of training Hollis was assigned to March AFB in California for a short time and then shipped to Hill AFB in Utah for mountain flight training. All of his training up to that point had been flat land flying and the wind currents were much different in the mountains. Hollis knew what was coming next. In September of 1952 he was sent back to Korea where he flew cargo, people and wounded soldiers from Soule, Korea to Japan. A really big thrill for Hollis was the one time that he was allowed to fly a C-54, a big 4 engine transport. Many times Hollis would shut down one engine of the C-47 to save fuel. Hollis came home from the war in October of 1953 and spent 3 months at McClelland AFB in California before being transferred to Fort Campbell, Kentucky via March AFB. At Fort Campbell Hollis flew training missions for tyhe 82 Airborne paratroopers. After 6 months he was assigned to Ellington Field where he flew cargo all over the United States. It was much later that he found out that he was flying cargo from all over the US back to Ellington that was used to build NASA. In April of 1957 Hollis decided to resign from the Air Force, go into the Active Reserves where he remained for 6 years finally separating with the rank of Capitan. Once out of the Air Force Hollis went to work for Halliburton. He always wanted to be an engineer so he began taking courses in 1954. Later he took courses at night studying all the basics, including English, Math and History. In 1958 Halliburton moved him to Abaliene, Texas where he said Halliburton worked him nearly to death as a logger. He was taking night classes at Abiline Christian College but they did not offer any engineering course. While there he met his future wife, an Oklahoman. In 1968 Hollis left Halliburton and moved to Waco, going to work for Brazos Power as a draftsman and surveyor. Baylor did not offer any engineering courses either and Hollis was dead set on becoming an engineer. He really wanted that engineering degree. He could have gone to Texas A&M or even the University of Texas but the problem there was that there were no jobs in College Station or Austin. Hollis and his wife began watching the Houston newspapers and saw a job offering by Houston Pipeline. Hollis contacted them, scheduled an interview and ultimately landed the job. After moving to Houston, Hollis worked days and went to the University of Houston at night and received his coveted engineering degree in 1954 and became a bona fide engineer. Hollis remained with Houston Pipeline, got a raise and an office and was united with a project engineer named Milton Crow who took Hollis under his wing and taught him the business. One Monday morning Hollis showed up for work only to hear the shocking news that Mr. Crow had passed away of a heart attack the previous Sunday. Hollis took over the job on an interim basis and assumed that it would be his on a permanent basis soon. All of that changed when a company vice president brought a young fellow into the office and told Hollis that the young man was to be his replacement and that Hollis was to train him for the job. Upon discovering that the young man's degree was in Liberal Arts, Hollis went to the vice president and resigned. That was in 1966 and at that time engineering jobs were very easy to find and Hollis found one by 2PM that same day almost twice the salary he had been drawing. Trans Western Pipeline Company made him a project engineer for a project in Kermit, Texas. Hollis and his wife, Cathy and daughter, Glenda made the move. Hollis finally retired after 30 years with Ingersol Rand in 1998. But that didn't last long. 4 months later he was recruited by TSI back in Houston and finished a job in Arkansas in 2002 and retired for good. In the interim Hollis and his family had moved to Eagle Lake, Texas in the early 1990s where his mother and sister lived. Hollis and his sister still live in Eagle Lake. His wife, Cathy, is now in a nursing home in Columbus, Texas. Hollis is a proud member of VFW Post 8783 and the Eagle Lake Ex-Military Assoiation. One day the base Public Service Officer was escorting a local reporter around the base. The reporter wanted to look inside an airplane so the PSO took him to Hollis Smith's plane, a C-47 Gooney Bird. Hollis and his co-pilot, Stretch, were giving the guided tour. The reporter sat down in the pilot seat and was touching everything in sight. He looked down between his legs and grabbed what is known as the "relief tube" (you can imagine what relief it offers) and asked what it was. Hollis, not much for conducting guided tours of his airplane, told the reporter that it was an intercom. He said there was one at the pilot's seat, one at the co-pilot's seat and one in the back of the plane. Hollis said that you blow into the tube and they can hear it in the back and will listen with their ear to the tube as you speak in the cockpit. The reporter blew and blew on the tube. Hollis and Stretch were doing all they could to keep from bursting out laughing. The PSO had to leave the cockpit as he was about to lose it. Hollis said that someone must have told the reporter later what the tube really was because a couple of days later Hollis saw the reporter walking around the base and the reporter gave Hollis the damnedest look he's ever seen. The look was so gruesome that Hollis had the urge to turn around and run like hell.